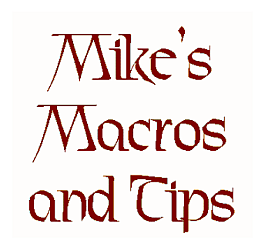 This site contains references to several macros I have created for WordPerfect and InfoCentral, plus some tips for using those programs. I also have a couple of useful forms for Peachtree Accounting for Windows. The following table shows what is available (click on a file name to download). I have also added the files and materials from the talk about WordPerfect I gave at the ABA Solo Conference in Denver a few years ago, here: ABA Materials. If you just want to see the latest changes, check the What's New page..
ConvNum.zip 6/7/18. Version 2.03 of the venerable Number Conversion macro, rewritten for a nicer interface, easier to understand code, and to pull localization information from the Registry. No customization needed. 2/9/02. A duplicate of a bank's deposit ticket template for WordPerfect. It is called by the macro "Deposit Account.wcm" (included) which allows you to select among several accounts, and to set the ticket number. To use it properly, you need the (included) MICR font on your system, and you need to edit the template and its macro to add the right information. Instructions are in README.WPD in the archive. 6/29/00. The Directories toolbar concept. Links to a page with a graphic screen shot of my WordPerfect setup, showing the Directories toolbar running down the left of the screen. Each button accesses a separate directory. Better than a QuickList! Instructions on how to do it are below the picture. 12/14/10. Contains DRAFTMAK.WPG, a graphic of a "DRAFT" watermark, 3-D, going diagonally across the page, with the current date inserted below, plus a macro to turn it on and off and update the date to today's date. 4/4/14. A Zipped archive containing the latest version of the Custom Letterhead Envelope macros, templates, utilities, and graphics. They also contain InfoCentral macros and utilities that work with the WordPerfect macros, a Setup macro, and instructions that run automatically. Click here for a detailed description and to see what it looks like or here for the "Mini-Manual." 1/04/05. A WordPerfect document containing a function key keyboard template, identical to that formerly supplied with the retail version of WordPerfect. For versions 9 to 12; print it out on cardboard on a color printer, fold into a triangle, and set it above your function keys. 7/20/12. A simple macro to save the current letter to a client folder with a unique name. Useful for ongoing archiving of correspondence. See the ReadMe.txt and the macro itself for details. 2/14/02. A macro which displays a menu of your frequently-used macros for easy access; now you can run or edit. 7/8/00. My default template, containing my toolbars, keyboard, and styles. If you want to copy over things directly. 10/29/15. Contains some other WordPerfect macros: CONVNUM.WCM (number conversion to text), Date Ordinal.wcm (inserts an ordinal date: e.g., "the12th of May, 2000"), FixText.wcm (removes extra fonts and/or spaces and/or hart returns and/or MS Word codes), and Green Card.wcm (formats a certified mail card automatically from a letter). 7/17/18. This toggles your display between displaying your merge codes in full and displaying them as markers. Assign it to a button on your toolbar (icon included). 7/25/18. Version 2.0. The new version of MergePlus is simpler and quicker than the MultiMerge concept. MergePlus allows you to merge all of the FRM files in a folder at once (including Windows shortcuts to FRM files), allowing you to create your own document template sets for projects or clients. It allows you to select a DAT file and a destination directory for the result, and keeps that setting. So when I merge several documents in a row for a client, can just open them all then use MergePlus to assemble them one by one - OR I can tell it to just merge everything in that folder. It has options for saving and/or generating the resulting file, and optionally to save PDF copies. I use this exclusively instead of the internal Merge function. Includes some instructions and a PNG file for the icon. Merge_Techniques.frm 10/3/08. A WordPerfect file containing some handy techniques for using Merge form and data files for document assembly, including an embedded macro to insert a document date and the "use nested fields as variables" technique. 5/23/06. Version 3.3 , which adds the option to combine the resulting files into one file. A macro to run multiple merges at once, using a text configuration file. For instance, I commonly merge a Declaration of Guardian, Durable Power of Attorney, Medical Power of Attorney, and other documents with a client data file for estate planning clients. Instead of opening each file and merging each separately, using MultiMerge I can merge the standard set all at once. To see what it looks like, go here. 10/19/06. A PerfectScript macro to "flatten" PDF (Acrobat) forms, making the form fields uneditable. Great for archiving and/or sending tax forms to clients. ADDED: a REG file which will create a right-click context menu to do it without the WordPerfect macro, which is even handier, though it takes a bit of editing to set up properly. PrintOC.zip 1/25/08. This macro prints an original document from one location, then a copy or copies of that document from a different location. If you are printing a letter, it can figure out how many copies to print automatically. I use it to print an original letter from the sheet feeder (letterhead bond), then copies from the regular paper tray. It is also useful to print the original and a copy of any document to go to a client. There is a setup dialog where you select the paper size/types (that is how you select different sources in WordPerfect), which saves your settings to an INI file in the macro directory. SaveAs.zip 7/18/18. Version 1.4. A macro to save the current document as one of six formats: ANSI Word Processor, ASCII Standard, HTML, Rich Text Format (RTF), Word (DOC), or WordPerfect. (Since Microsoft has withdrawn support for the Compatibility Pack, WP can no longer save to DOCX.) Avoids having to scroll through the hundred or so file formats in the native "Save As" dialog box to find the most commonly used ones. Also includes a "Save as Word DOC.wcm" macro that bypasses the dialog. The "Save as Word DOC" can be modified to save as any of the other formats (e.g., turn it into "Save as ANSI Text" or "Save as HTML"). Also included are two icons. Save&Mirror.zip 11/7/11. Version 1.3. Save&Mirror saves your document, and "mirrors" a copy to a location you designate. Save&MirrorSetup pops up a dialog box allowing you to set the mirror location and set whether you are asked to confirm the remote file overwrite. I use it to work on documents on my laptop computer at home. 1/07/04. A macro to replace the broken SendKeys feature in WordPerfect 9 and later versions. Use it or refer to it in your own macros. 2/20/04. A macro to (1) select the address of the letter you're sending, (2) run the Stamps.com software, (3) optionally insert your password automatically, then (4) insert the address in the software. TemplateReplace.zip 1/22/16. This macro replaces the template used on the current document with the default template, allowing access to your default styles more naturally. 7/30/99. Contains a WordPerfect document giving various examples of how one can do text formatting using the Tables feature. 7/17/18. Contains a collection of icons for the WordPerfect toolbar (PNG files and bitmaps). 4/02/12. Contains templates for printing checks and deposit tickets on blank stock directly from Peachtree Accounting (note that earlier versions may not be able to do deposits), plus an MICR font. This way, you can print checks and deposit tickets for several different accounts using one store of blank stock. NOTE: Bud Aaron at DotNetChecks (formerly CheckMaster) kindly pointed out that the font I formerly had in this archive belonged to him. Anyone who has downloaded this file, please download this new one and remove the old MICR font from your system. Anyway, I have replaced it with the font I actually use. This is for people who like to fiddle and set up things themselves, and works perfectly for me. If you want a more user-friendly, turnkey way to print checks on blank stock, you can use software such as that available at http://www.checkmaster.com. changing the "at" to a proper "@" symbol. WordPerfect and InfoCentral are registered trademarks of Corel Corporation . Peachtree Accounting is a registered trademark of Peachtree Software Inc. This site is not affiliated with Corel Corporation or Peachtree Software Inc.